The worst has happened. For Directioners anyway. One Direction are set to disband in March, according to a report in The Sun. Harry Styles, Liam Payne, Niall Horan and Louis Tomlinson have reportedly decided to go their separate ways for at least a year to focus on solo projects. The band are also reportedly not going to tour for their fifth album, a decision that apparently came after a meeting in London last weekend. A 1D source told The Sun: “The guys have been together for five years, which is an incredible run for any boyband. “They fully deserve to have at least a year to work on their own projects. There is absolutely no bad blood between them and they are all 100% behind the decision. The newspaper’s source said that Zayn Malik’s departure was not behind the decision. Mark Ronson feels like he's "past [his] sell-by date". Adele's new album is out in November. Dannii Minogue has "the bug" to make music again. 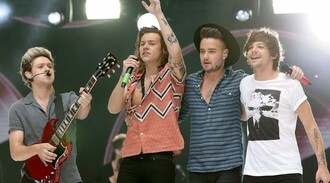 One Direction 'to disband' and focus on solo projects. Morrissey is to release his debut novel 'List of the Lost' in September. Iron Maiden have revealed that one of their new album's songs is dedicated to the late, great actor Robin Williams. Taylor Swift reportedly turned down £2 million (€2.7 million) to perform three songs at a billionaire's wedding. Kaiser Chiefs’ Ricky Wilson lands DJ role on XFM Radio. Kasabian want to set up a record label. Lana Del Rey will release her new album next month.